The DotNetNuke Survey module displays an Add Question option on the module's menu (and in the footer of the module) for any user that has Edit access to the module (usually the Administrator). If you are familiar with the NavigateURL function (see: NavigateURL: How to make A DotNetNuke® link) you know how to provide navigation from one user control to another in your modules. To add items to the modules menu, you use the IActionable interface. When we Implement the IActionable interface we communicate to the DotNetNuke framework that we will create a property that will return a ModuleActionCollection object. 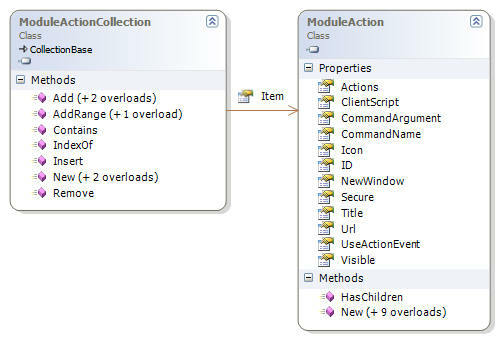 We can see in the class diagram below that ModuleActionCollection is a collection of ModuleAction objects. This overload creates a ModuleAction object and adds it to the ModuleActionCollection collection. [Sets the text displayed on the menu] Localization.GetString(Entities.Modules.Actions.ModuleActionType.AddContent, LocalResourceFile) "Add Question"
[The URL of the Icon to place next to this action] "" ""
[The destination URL to redirect the client browser when this action is clicked.] EditUrl() "http://localhost/DotNetNuke/Home/tabid/36/ctl/Edit/mid/423/Default.aspx"